I did not grow up eating french toast. In fact I think the first time I ever ate it was in my 20’s. If I ever had it as a kid I just don’t remember it. And now that I’ve experienced it’s tastiness, I know just what a travesty that is! French toast is legit. And this casserole is ssssooooo good and perfect for large groups. I made this for my Sunday School class, and it was a big hit. We had some left over and I was thrilled to get to take it home and gorge myself eat another piece. Seriously though, this was one of my favorite breakfast dishes ever. One of the best things about it (aside from the sweet, syrupy goodness) is how convenient it was to make. On Sunday mornings, I’m busy getting ready for church and don’t like having to spend a great deal of time cooking breakfast. This was the perfect solution! You actually make it the night before, refrigerate it overnight, and then bake it in the morning! It was wonderful! All I had to do was pop it in the oven and it cooked while I was getting ready for church. Easy Peasy! This would also be perfect for Christmas morning. You can be spending time with your family and enjoying the holiday without all the mess of making breakfast. Plus, they’ll all think you’re the best chef ever because it’s so good. Melt butter and then add brown sugar – stir until mixed. Spread butter/brown sugar mix into bottom of 9×13 pan. Lay down a layer of french toast bread (cut off crusts if desired). Beat eggs, milk, vanilla & powdered sugar. Ladle half of egg mixture onto bread. Sprinkle with brown sugar and cinnamon. Spread thin layer of butter on one side of french toast bread for next layer (cut crusts if desired). Lay down second layer of bread, butter side up. Ladle remaining egg mixture on top. Sprinkle with white sugar and cinnamon. In the morning, remove from refrigerator, uncover, and preheat oven to 350. Cook for 45 minutes. Before serving, drizzle with maple syrup and sprinkle powdered sugar on top. I’ve never thought of making something like this It looks so good!! Wow! Thanks Bonnie! I’d never done anything like this before either but I’m so glad I did! It was SO GOOD! Great recipe I love do-ahead things like this when we have overnight guests Just take them out of the fridge and pop ’em in the oven! Me too! This one was amazing! Lindsay, wonderful recipe. I am going to try it! Thanks, I hope you like it! I was really blown away by how good it was. One of My bridesmaids made this for us girls on the morning of my wedding. Still remember that tasty dish! Yum! You are right; it would be great for Christmas morning. 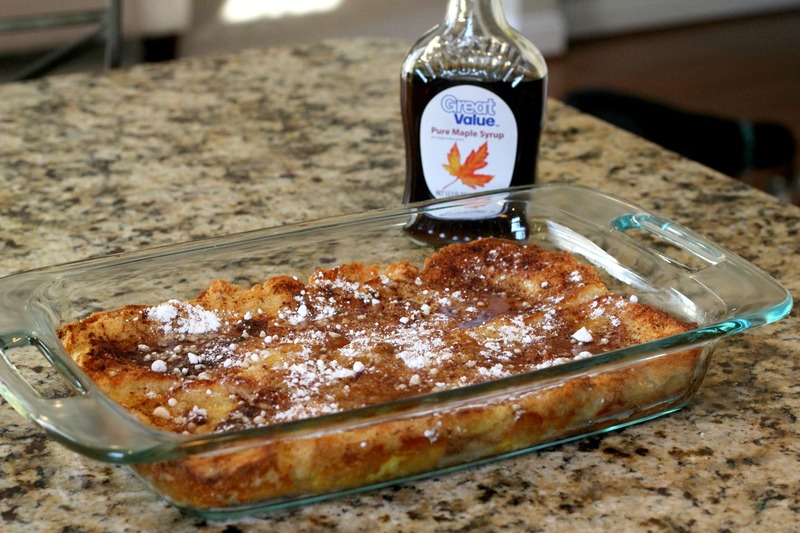 I think I’ll skip trying monkey bread for this French Toast casserole! Do you have to make this before hand? Would not refridgerating it make a difference? And what is good “french toast bread”? Like white bread? Hi Melissa, I don’t think you HAVE to refrigerate overnight because I don’t think it would make much difference. However, I’ve never tried it so I’m not 100% sure. As for the bread, if your grocery store doesn’t sell “french toast bread” then just get thick Texas Toast bread.